Sift the flour and salt into a large bowl stir in the yeast and rosemary. Gradually add warm water and olive oil to form a dough. Turn onto a floured work surface and knead for 10 minutes until elastic then place in a bowl cover and leave to rise in a warm place for 1 hour or until doubled in size. Meanwhile soak the sun-dried tomatoes in warm water for 20 minutes drain pat dry and chop roughly. Pre-heat the oven to 200ºC/400ºF or Gas Mark 6. Lightly oil a large shallow roasting tin or baking tin approx 28x22cm. 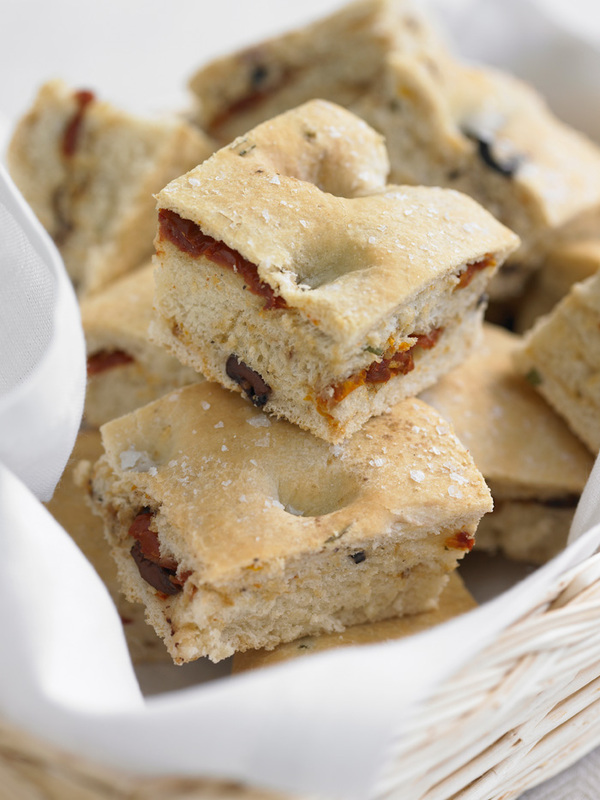 Knock back the dough on a work surface and incorporate the sun-dried tomatoes and olives, kneading them into the dough, then dip your fingers in olive oil and gently press out the dough until it fills the tin evenly. The dough should be 2cm/ 3/4in thick. Brush with olive oil and make small indentations all over the surface of the dough. Cover with a damp tea towel and leave to rise for 30 minutes. Scatter over the salt and bake for 20-25 minutes until golden brown. To serve cut into squares or slices.